How high are realtors´ and lawyers´ fees in Ghana? What about other property purchase costs? How difficult is the property purchase process in Ghana? 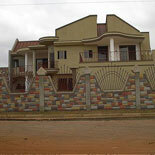 There are no restrictions on foreigners buying property in Ghana. However, different kinds of land, some of which cannot be privately owned. There are four types of land in Ghana: Government Land, Vested Land, Customary/Stool Land, and Family/Private Land. Customary Land belongs to different Stools in Ghana, who have the authority to grant the particular customary land for which they are responsible. The 1992 Constitution states that there must be no free hold interest granted in land. The services of a real estate agent and a lawyer are needed in acquiring property. A title search is very important to determine the ownership and kind of land the buyer is interested in. Once all agreements have been settled, a Deed of Conveyance, or an appropriate instrument of transfer (indenture), is prepared by the lawyer. Upon signing, the title is transferred to the buyer, who, at the same time, pays for the property. The title is registered at the Lands Commission Secretariat. Property registration takes around 48 days to accomplish, with around five procedures. Stamp duty is levied on the value of the property at progressive rates, from 0.25% to 1%. Ghana uses Ghanaian Cedi. Exchange rate is at US$1=GHC9,556.41 as of 5th July 2006. How landlord-friendly is the law in Ghana? I would like to get the step by step process of registering a property in Ghana, especially for the citizens who are first time home buyers. Maybe one could give me a generic process that could be compared to other neighbouring countries.